BAYJI, Iraq (Army News Service, Aug. 15, 2008) — Iraqis taking care of Iraqis — this is the shape of things to come here. Garnering the trust and cooperation of the Iraqi people, Iraqi Army battalions near the oil-rich town of Bayji, have made the turn. No longer is the burgeoning Iraqi Army being coddled by their American counterparts. 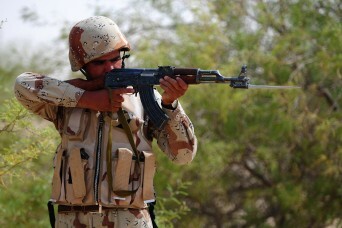 Rather, according to Military Transition Team Soldiers of the 1st Battlaion, 327th Infantry Regiment, Iraq’s defenders are confident, determined and capable of securing its citizens. As violence tapers off across the country, Iraq’s security forces are increasingly taking responsibility for the security of the people. Seen as a critical component of success here, Iraq’s Army has grown from a pocket-sized force in 2004, to a military monolith that has earned the trust of the people and the respect of its coalition partners…. Who’d a thunk it? Us, of course! But don’t wait for the msm to print this. YOU can find the rest of this B*N*S*N story here.